Theme Lapel Pins - "Light up Rotary" - 1" gold plate. 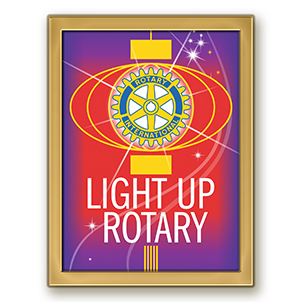 2014-15 Magnetic backed Theme Lapel Pins - "Light up Rotary" - 1" gold plate. Trading Banner 2014 - 2015 Theme 9" x 12"
Podium Banner 2014-15 Theme -- 18" x 26"
2014-2015 Theme banner. 18" x 26" Podium sized banner. Wall Theme Banner - 60" x 40"
2014-2015 Theme banner. 60" x 40" wall sized banner. 100% double-mercerized cotton polo shirt with rib strip jacquard body. Ideal for the office or after hours, this feminine cardigan is crafted from incredibly smooth "Silk Touch" knit.